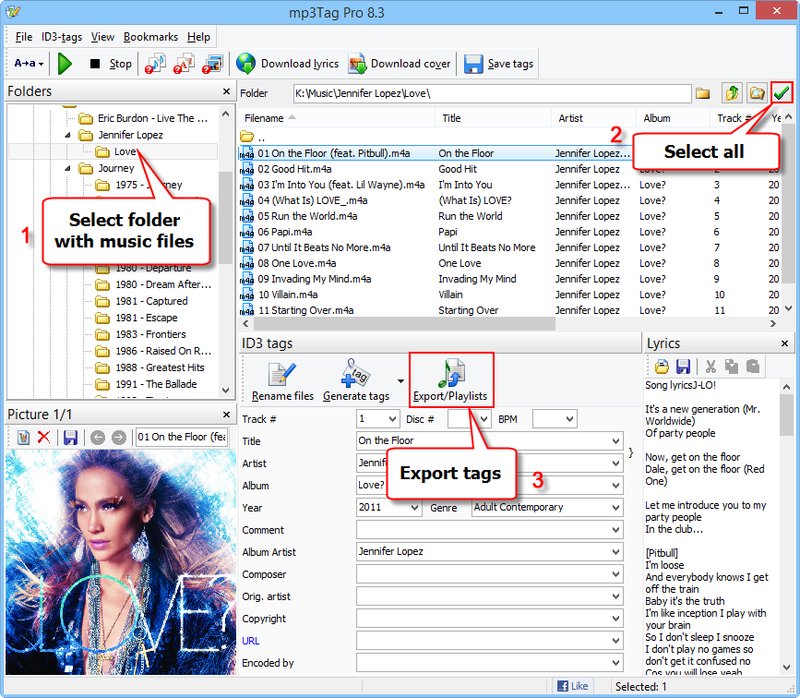 mp3Tag Pro allows creating and correcting tags of music files (MP3, FLAC, APE, M4A, AAC, and other formats) in many ways. You can download tags from MusicBrainz, Amazon, FreeDB, Discogs, extract tags from filenames, import tags from a text file. Additionally, it is possible to rename and sort audio files. While mp3Tag Pro includes powerful tools for processing tags, you can do even more using a spreadsheet application like Microsoft Excel. For example, this would allow you to find and replace a certain sequence of characters, swap fields and more. Results can be imported back to the files. Alternatively, the export feature can be used for backup and some other purposes. As first, select the files you want to export tags from. In the "Folders" area of the main window, select the folder containing your music files (1). Songs will be displayed in the main area (on the right). Click the green checkmark button (2) to select all files. If there are several nested folders, and you want to include files in the folders, click the "Scan subfolders" button near the checkmark button. Finally, click the "Export/Playlists" button (3). When we rename files or generate tags from filenames, the "Format" field controls everything that happens. When we export tags, the field can be ignored completely. However, the list of variables next to this field is still important. Every field that we want to export must be checked (have a checkmark in the box on the left). By unchecking a field we remove it from export. We can also change order of fields. From the "Export to" dropdown list, select the format you want to export tags to (1). 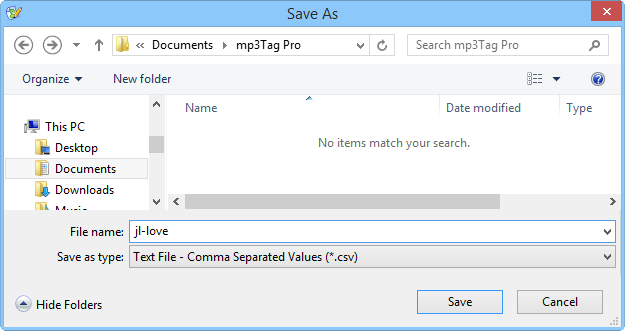 mp3Tag Pro supports tag export to MS Excel, CSV (comma-separated values) and TSV (tab-separated values) files and two types of playlists. If you want to export tags to MS Excel, you must have Excel installed in your system. If you use other office suites, just export to CSV and load the resulting file in your spreadsheet application. 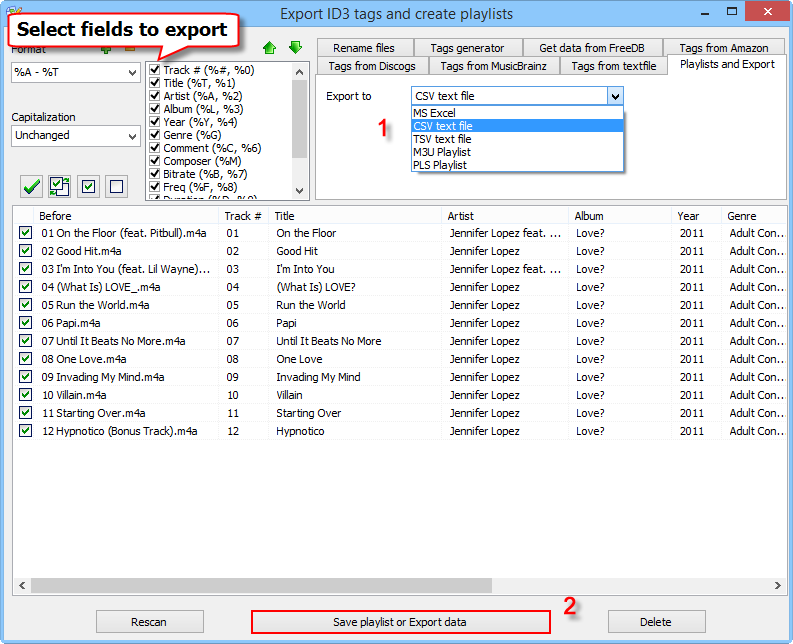 Click "Save playlist or Export data" (2). Enter a name for your file and select a location, then click "Save". After processing tags, we can import them back to our audio files.